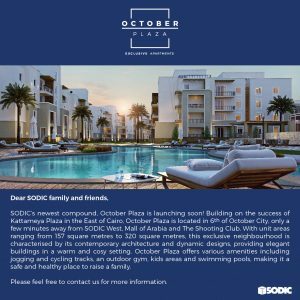 SODIC’s newest compound, October Plaza is launching soon! Building on the success of Kattameya Plaza in the East of Cairo, October Plaza is located in 6th of October City, only a few minutes away from SODIC West, Mall of Arabia and The Shooting Club. 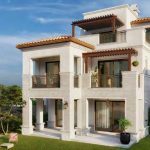 With unit areas ranging from 157 square metres to 320 square metres, this exclusive neighbourhood is characterised by its contemporary architecture and dynamic designs, providing elegant buildings in a warm and cosy setting. October Plaza offers various amenities including jogging and cycling tracks, an outdoor gym, kids areas and a swimming pool, making it a safe and healthy place to raise a family.